One Friday while cleaning off my dresser (how does all that stuff get up there?) I came across an old bangle that I just refuse to throw away. I took a moment to think about why I didn’t wear it anymore and the main reason was it didn’t LOOK good anymore. All the time it spent rolling around in my sea of jewelry had taken it’s toll as it looked rusty and just unattractive. 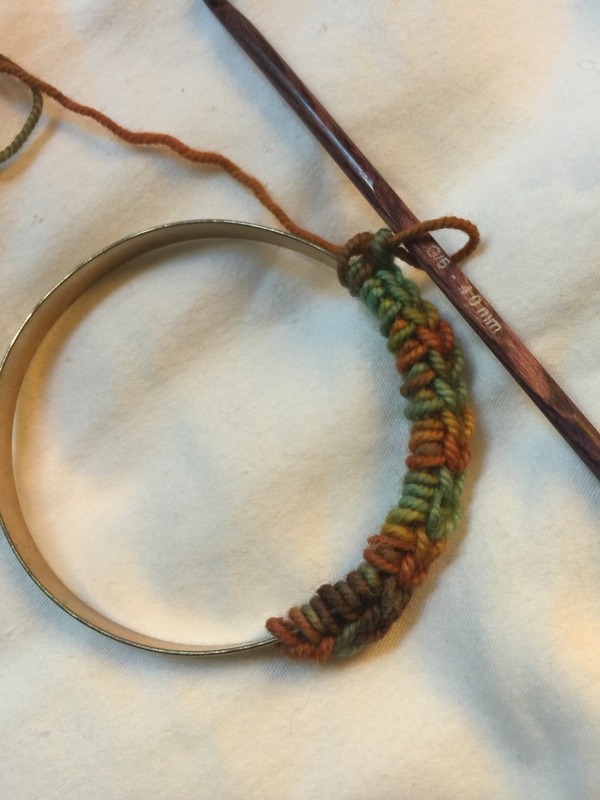 I have always wanted to knit me a bracelet. 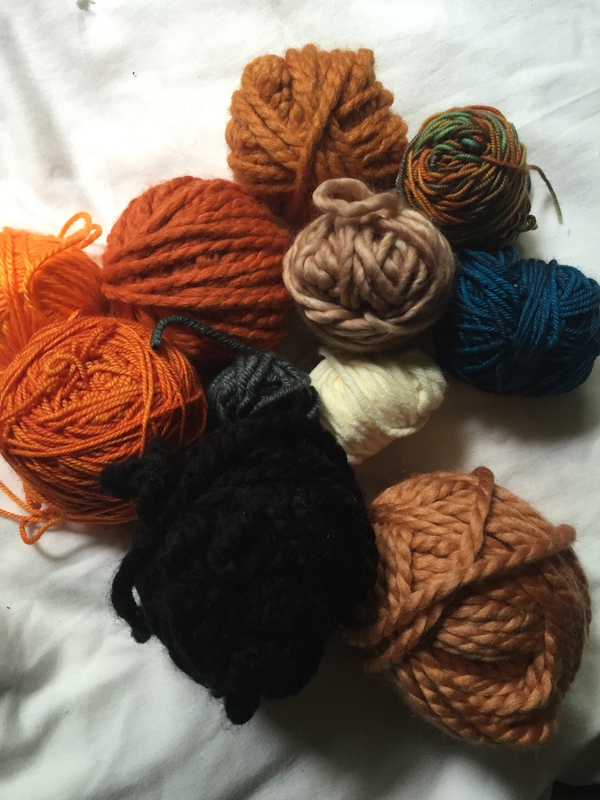 There is a pattern on Ravelry that I have had in my favorites FOR E V E R!! 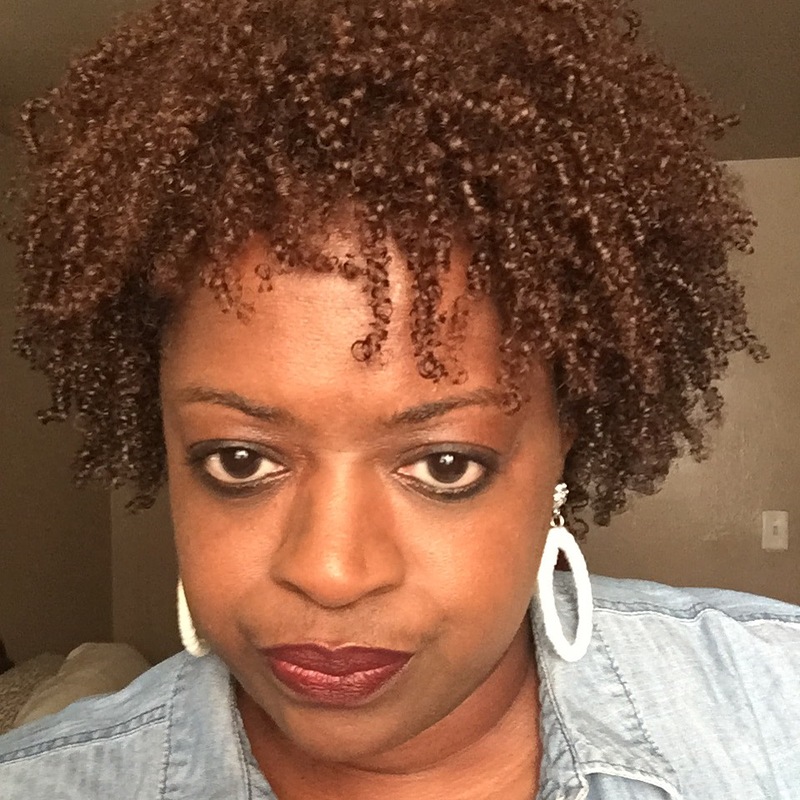 I swear that is a pattern gravesite, because I put them in my favorites and then forget about them, but I digress, back to the bangle. So I had a lil bit of Madelinetosh ASAP that happened to be sitting on the dresser from hell, right near the bracelet. Did you see the lightbulb go off? Did you see the speech bubble above my head? It said “hmmm I could cover that bangle in yarn, can’t I?” You didn’t see it? Why? Oh, you weren’t looking? We will talk about that later. You like my arm candy? I do/did! So Saturday morning, lookout because I was covering EVERY thing! I had lost my mind. 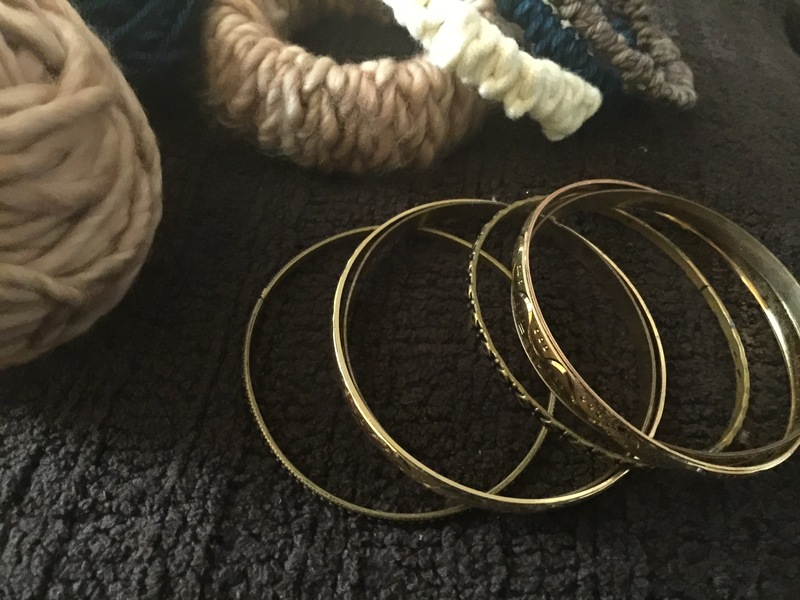 I was going through my jewelry box searching for bangles, I knew I had more somewhere and of course I had more scraps. Every yarnlover worth their salt has a bag, box, basket or whatever FULL of lonely leftover yarn, am I right? 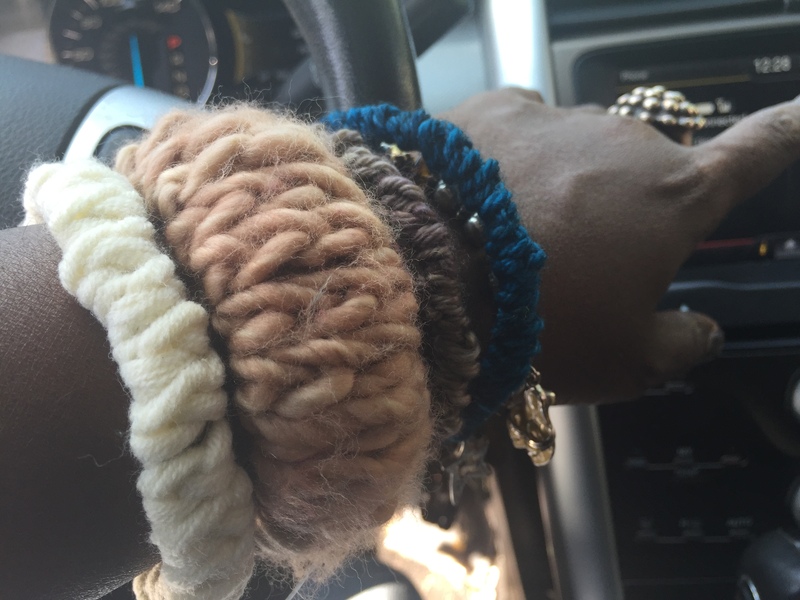 Yes I could turn this old jewelry into more, with the help of a little leftover yarn!! Woot Woot! 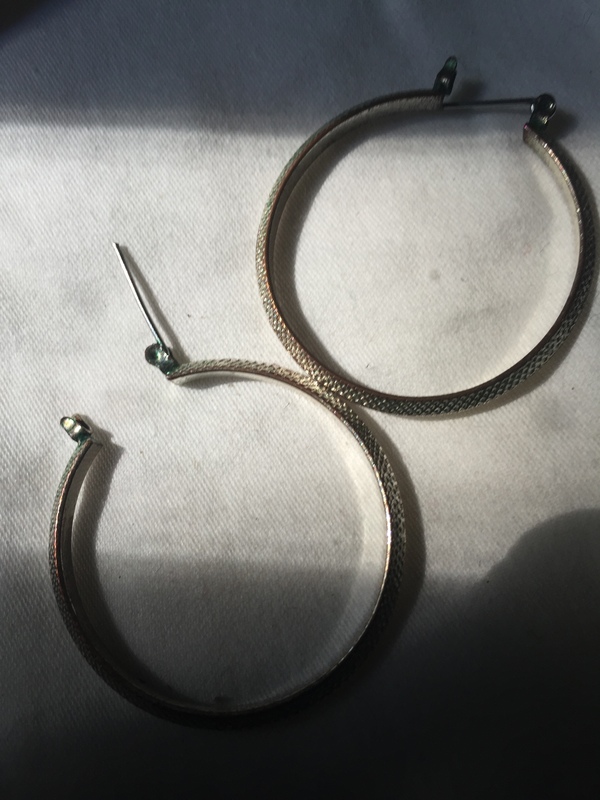 I had bangles and earrings that I didn’t wear because, well they were waiting to be covered in yarn! hahahahahahahaha. She has lost her mind guys! because nothing was safe, I even have a paper weight that I was about to…yea it was crazy! 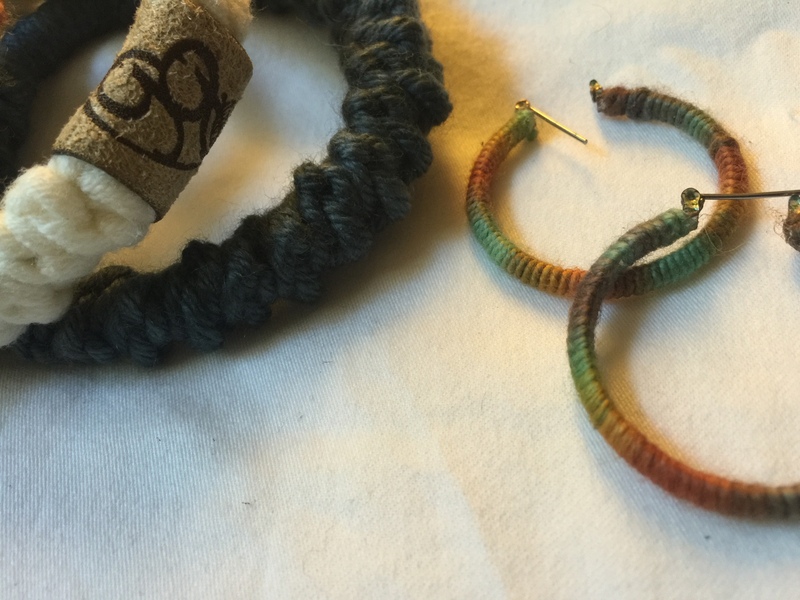 I tried different methods and different sizes, I crocheted around the bangle and with the earring, I just wrapped the yarn around the earring. I even put my label on one! You couldn’t tell me nothing! Hahahahaha! 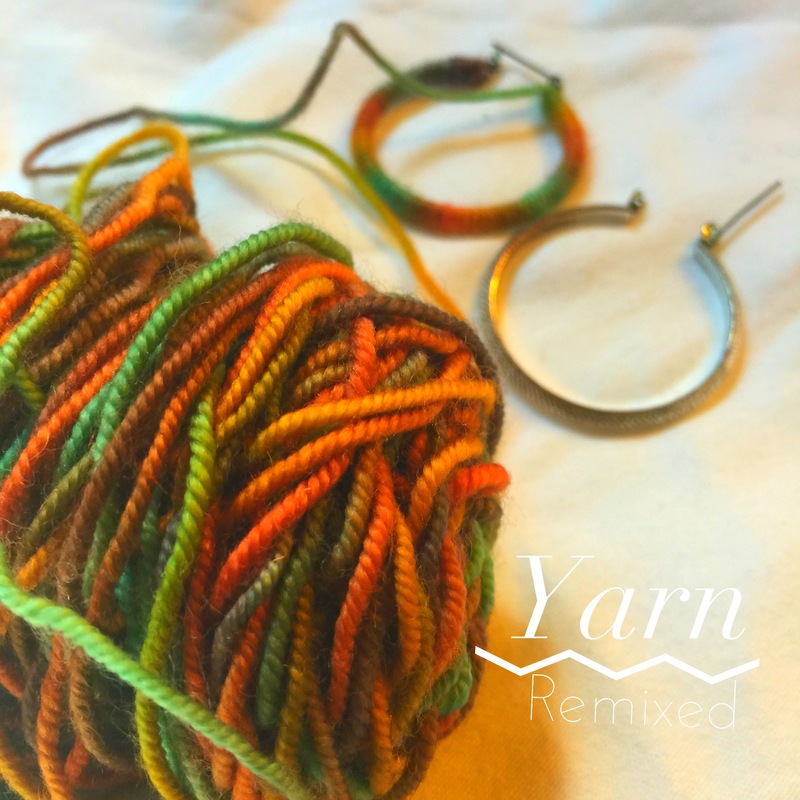 So don’t let that yarn go to waste, REMIX!! turn it into something new. Here is another picture of me wearing my lovely “new” bracelets. Hilariously funny, and yet another brilliant post! 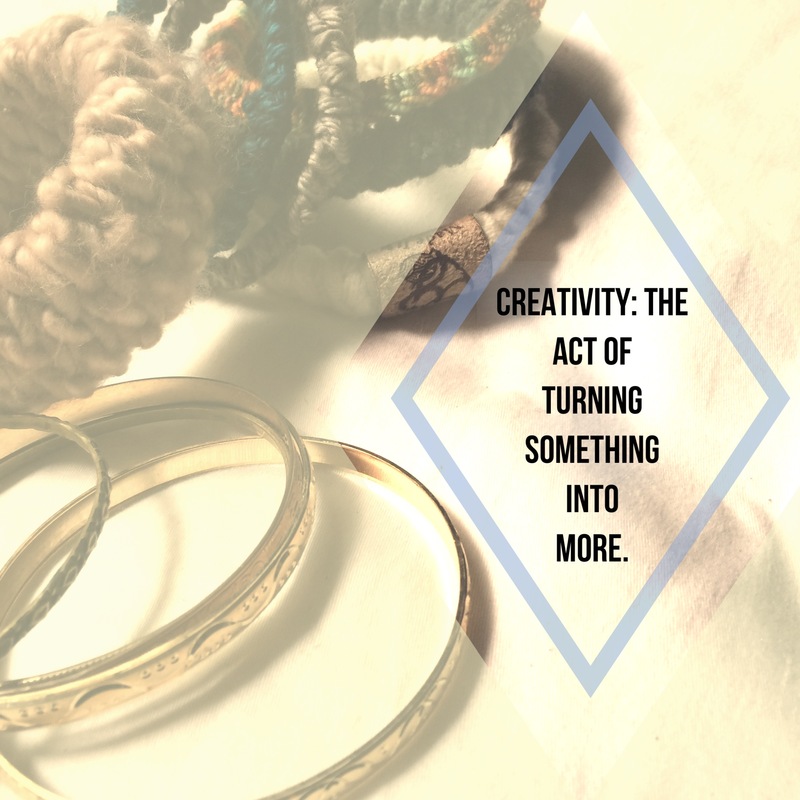 As an accessory fanatic, I know all too well about the rusty bangles. Thanks for the reminder of the many options we have! Girl, you know this post is speaking to me! I have lots of scraps and quite a few earrings that I haven’t worn for the same rusty reason lol! I threw a lot of them away but the ones I still have, I’m going to take some scraps and wrap them with yarn. 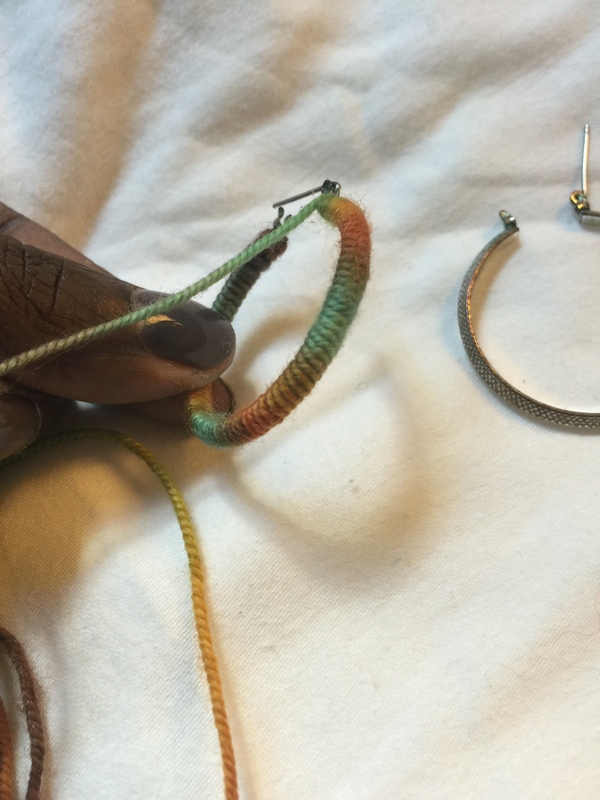 Question though: how did you secure the yarn to the earrings: with a knot, glue? Glue and go for it! Oh my goodness! I love it! You are too stinking creative for words. I love all the upcycle you’ve got going on – especially those earings!!! Too good! The jewelry looks great! So many reasons to do this with my old jewelry. 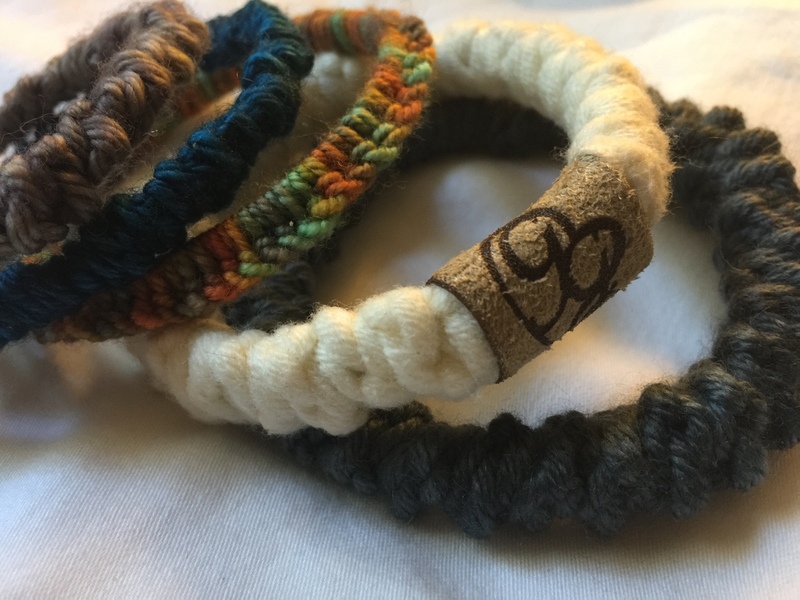 Love that you can use the extra bits of yarn leftover from other projects . 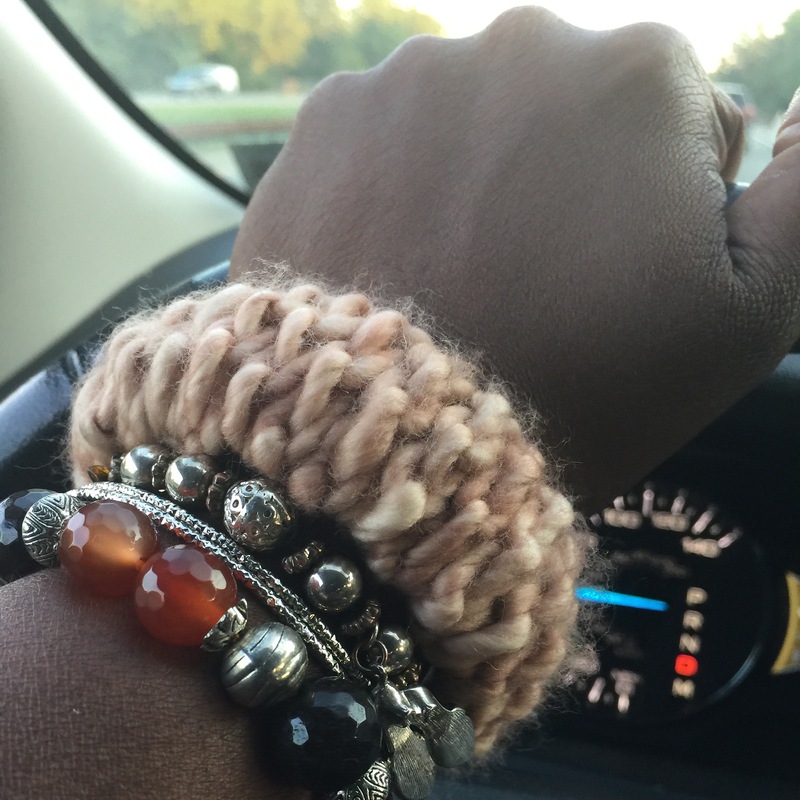 Plus when the yarn gets worn, you can just knit up some other pretty yarn and voila, a new piece of jewelry!